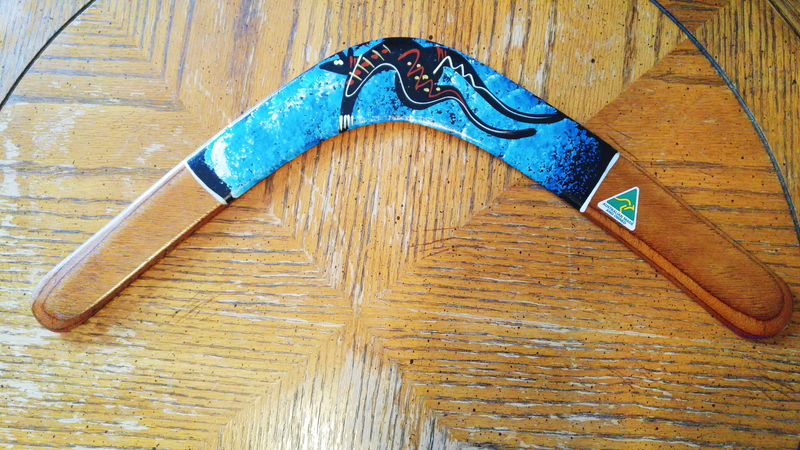 I was packing some stuff over the weekend and one of the items I packed was the boomerang that I bought during my time in Australia. 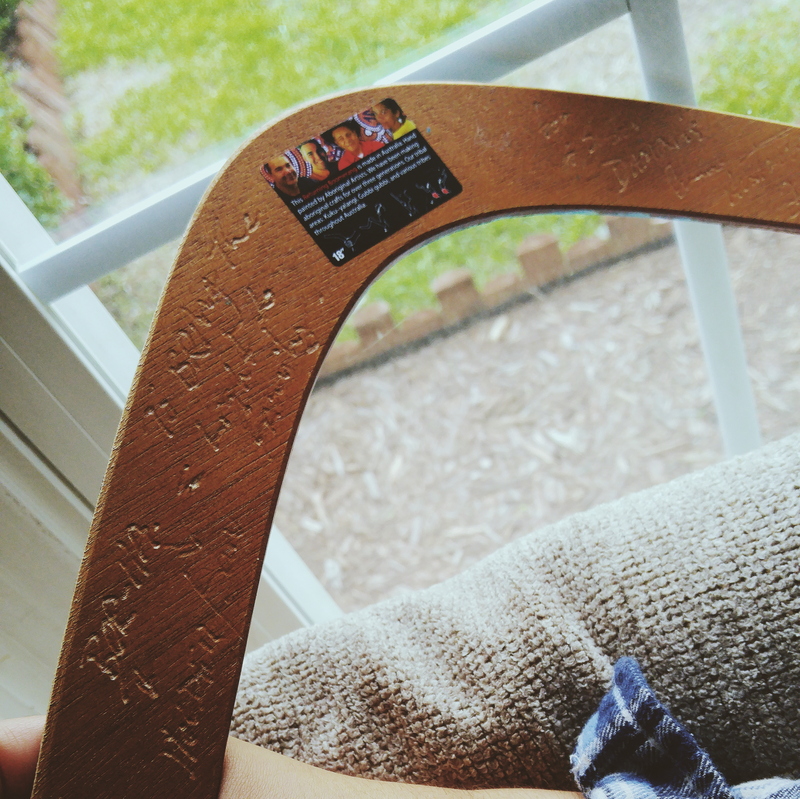 The story of how I came upon this boomerang is too good to not share! On the second or third day of the tour, we were in Cairns and going to have a “barbie” near the water. I asked our tour guide, LM, how I could help and he said I could get some ice from Woolworth’s. Two of my tourmates, Jake and Mollie, came along. I remember saying that we were going on an adventure – little did I know that we really were! Along the way there was a didgeridoo store and we decided to browse the store before buying the ice. We proceeded to look at the boomerangs on display and then an employee (maybe owner of the store) started talking to us about the boomerangs and how they are handmade by his grandfather and starts to tell us a little history of the boomerangs. We go to the cash register preparing to purchase our items when the employee started to point at the paintings of Aboriginal art on the wall and was talking about the story behind each of them. To be honest, I still don’t know what he was talking about but I was being polite and trying to understand which painting he was talking about. Then he proceeds to start walking towards the other items in the store and telling us the meaning behind a boomerang’s shape and the didgeridoo’s shape. We were so intrigued by this guy’s story that time seemed to not be a concern for us. His Aboriginal name is “Turtle.” He is a tall man, not so buff , of Aboriginal and Scottish descent. He has the greatest passion in telling us about his ancestry and the stories that have been passed down from generation to generation. He was telling Mollie and myself about how a man that is intentional about pursuing us will act; he was teaching Jake how to approach a female in a manner that was respectful and honorable. After a while I start to try to wrap things up because I had a feeling that we had been there for about 3 hours and we still hadn’t bought the ice to bring back to the group! Mind you, we did not have any way of getting in touch with anyone because we did not buy SIM cards and, although this conversation was very interesting, I was worried about disappointing our tour guide since I had offered to help out. At this point there was no trace of our whereabouts to the rest of the group. We eventually manage to leave the store, power walk to Woolworth’s, get to the ice freezer, ask ourselves if the group truly needs the ice at this point and, instead, we buy 4 packs of Tim Tams; we didn’t even get water to make it seem like it was so hot that the ice melted. Our new found friend, Turtle. Later in our trip we were at a dude ranch, close to Brisbane, where we were learning to crack a whip and throw a boomerang. As I am preparing to throw the boomerang, I notice the same sticker that was on the boomerang that I bought from the store back in Cairns! We were all laughing really hard whenever we talked about this because “Turtle’s” grandfather either makes all the boomerangs that are sold in Australia, has a lot of grand-kids, or Turtle is a very talented salesman and caught us three as deer in headlights and basically tricked us into buying 5 total boomerangs that day! At the end of our tour, LM made a confession- our group was the very first group he had ever led with ECFB and I was finally able to understand why he was really worried! I still laugh remembering this story because of course this could only happen to us! Life lesson learned: don’t look like a tourist when in a didgeridoo store. That’s an oddly specific life lesson 😄😄. I know right! Who would have thought you need to know these kinds of things hahaha!